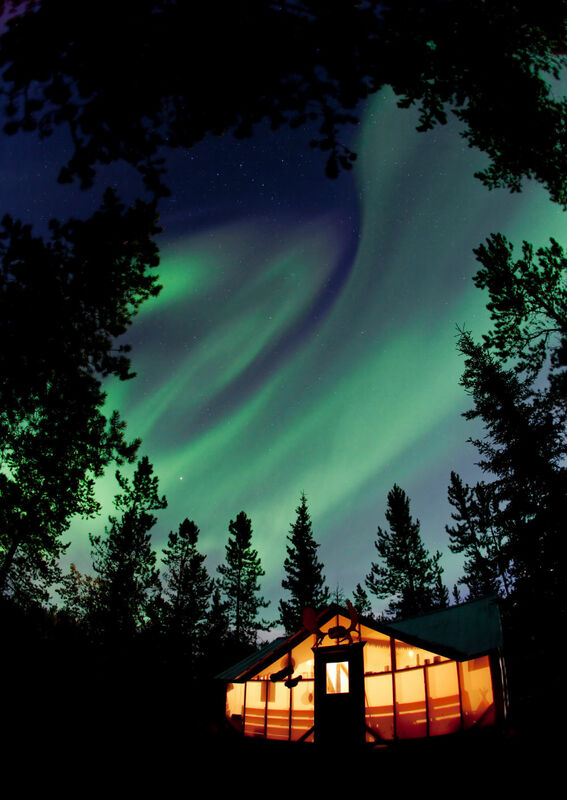 Aurora Borealis Itinerary for basic tour package combined with 2 nights in a remote and cozy cabin (self-guided) in Whitehorse, Yukon. All transactions are in Canadian Dollars. 5% GST applies. 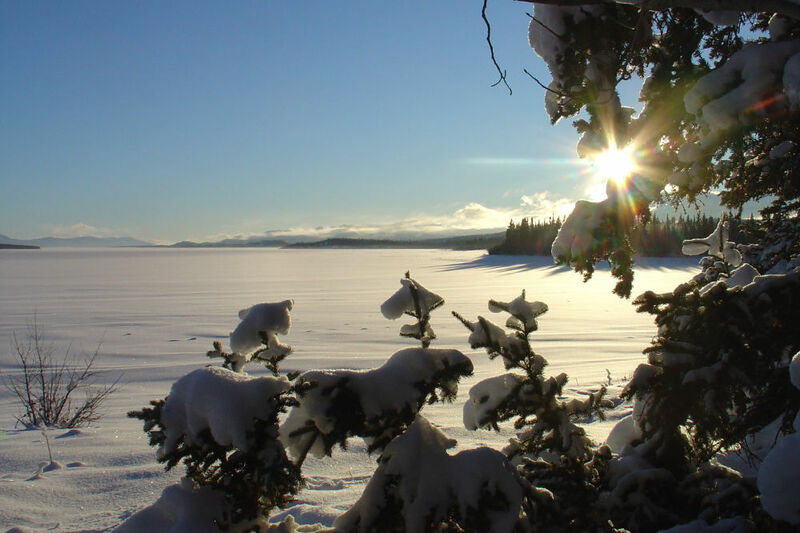 Get ready for three exciting days at world famous Lake Laberge the scene of the renowned “Cremation of Sam McGee” so eloquently set out in verse by Yukon’s celebrated poet Robert Service. Your next two nights and three days are spent in the seclusion of the Yukon wilderness and you’ll have to pick up enough supplies to do you for 2 breakfasts, 2 lunches and 2 dinners and of course the snacks and beverages that are a must around a bonfire in the evening. Every cabin at the lake is fully equipped with a propane cook stove, utensils and cooking implements so let your imagination roam. Don’t forget the marshmallows and Smokies – they’re delicious cooked on a stick over an evening bonfire. A short hour’s drive via Alaska and the North Klondike Highways bring us to the Fox Creek Road, a privately maintained, nine km backwoods road that follows the now frozen Fox Creek to the shore of Lake Laberge. The reduced speed and snow dampened road noise makes it apparent that you’re off the grid and on your own in the wonderful pristine world of snow. The breathtaking ride ends much too soon. After you arrival at the lodge you are assigned your cabin and the guide will familiarize everyone with the camp layout and amenities. 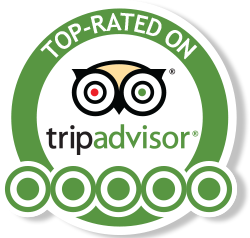 These include a well-heated washhouse with full bathroom facilities, and a sauna that is available on a first come, first served basis. There is enough daylight left for a hike down to the lake or creek or to climb to the viewing platform on the hill overlooking the camp, a snowshoe walk in the woods or one of the many optional activities available to you. As daylight wanes and the moon rises above the mountain range on the opposite shore you are immersed in the solitude and silence of the north broken only occasionally by the far away howl of a lonely wolf, the yipping of a coyote or the questioning call of a snowy owl. The “pièce de résistance” would be a clear night and the swishing lights of the Aurora in the starry sky above. Optional activities (must be pre-booked) available are: A two-hour or half-day of mushing your own dog team on Lake Laberge or on the many trails surrounding the lodge; a two-hour or half-day snow machine ride or an afternoon of ice fishing for lake trout on the snowy expanse of the lake. You can also simply enjoy a day of rest in the crispy and pristine setting of the camp. Morning at your leisure or optional half day tour in the morning. Transfer back to your hotel in downtown at 2pm. 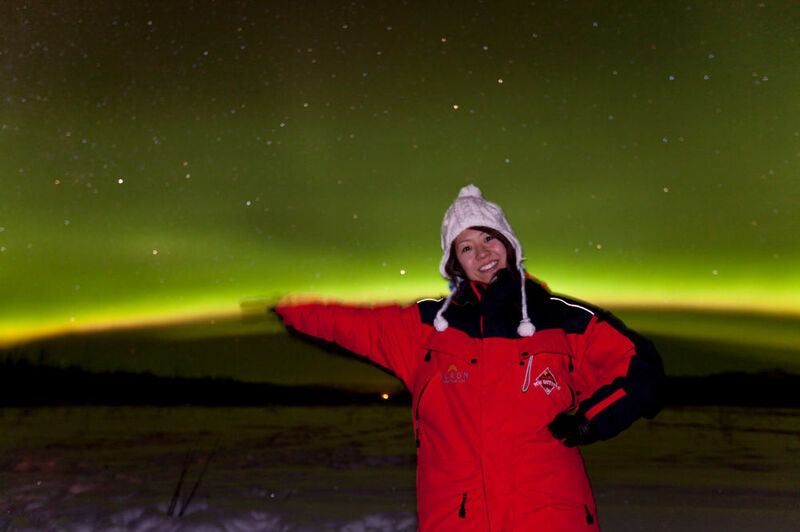 At 10 pm we will depart for another night of Aurora viewing at the Northern Tales Trading Post. Return to hotel around 2.30 am.